Theatrically Speaking: IKEA! IKEA! IKEA! Please note: Wasa Teater invited me to see this musical for free because it'll be featured in the Finnish musical podcast Musikaalimatkassa that I co-host. Wasa Teater's Ingvar! 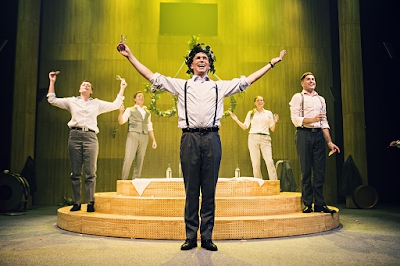 – en musikalisk möbelsaga is an odd musical. 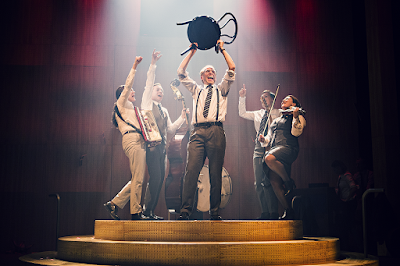 It's a sung-through musical about the furniture chain IKEA and its founder Ingvar Kamprad. Instead of painting a realistic picture of its titular character, though, Ingvar! turns the man into a myth and presents him as the messiah of the religion called capitalism. All this is told via cheerful folksy music – in Swedish, of course. Ingvar! is composed by Erik Gedeon, with lyrics by Klas Abrahamsson. It premiered in Hamburg in 2009 ("Das Wunder von Schweden, eine musikalische Möbelsaga"). It debuted in Sweden in 2010, and since, it's been popping up in theatres all around the Swedish-speaking corner of the world. In Finland, Ingvar! has been performed in Helsinki (Svenska Teatern, 2016) before. In September 2017, it premiered in Wasa Teater in Vaasa, directed by Markus Virta. Me and my friend met up with actors Anna-Maria Hallgarn and Erik-André Hvidsten before the show to record an interview for our musical podcast Musikaalimatkassa (here's a link to the interview in English and the full episode in Finnish). 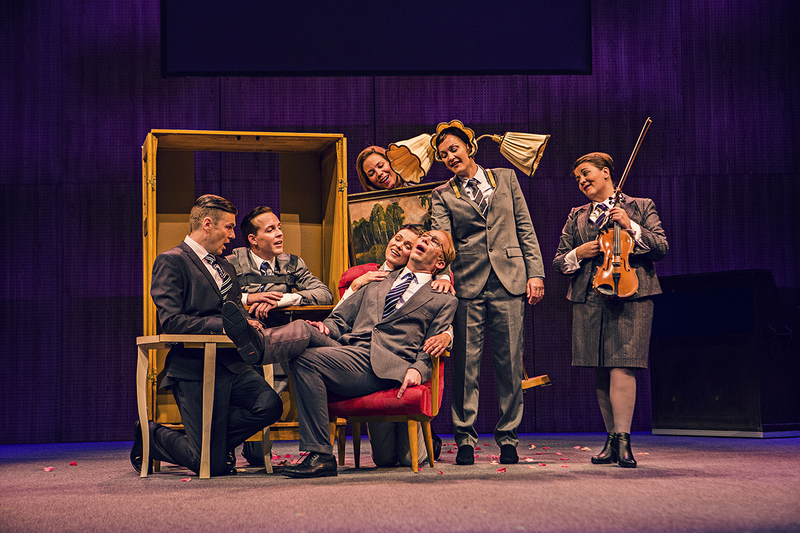 Among other things, we talked about how reserved Finnish theatre audiences can be: someone might think a play is the funniest thing they've ever seen, but if everyone else in the audience is quiet, they don't dare to laugh out loud. I mean to say that Ingvar! is hilarious. It's so funny. Something about the contrast in between the catchy music, the subject matter – the birth of a multinational furniture mammoth – and the lyrics – ranging from awkward praise of the Swedish countryside to songs about revenue and exploiting foreign workforce – got me. It's a weird combo, but really delightful at that. Ingvar! presents Ingvar Kamprad's life story like a twisted version of The Life and Times of Scrooge McDuck. From the moment he is born, little Ingvar's family starts teaching him in the ways of capitalism. And sure enough, he grows up to be a first-grade capitalist, one who swears by moderate pay but also moderate living. The show also recounts the beginnings of IKEA. I've never really thought about IKEA having an origin story. I'm young enough to feel like the stores have always excisted here in Finland, it's simply the way everyday furniture shopping is done. It's fun how Ingvar! makes you think about the concept. Picking your items from a warehouse all by yourself and everything in the store from the colours of the building to the menu of the restaurant proudly oozing Swedish vibes seems normal since we're used to it, but indeed, someone's had to come up with those ideas – and at first, they might have seemed weird to others. The musical is in Swedish, but the theatre offers subtitles in Finnish and English. That's good. After watching Les Misérables in Swedish for around 20 times, I'm getting a good grasp of standard musical vocabulary – you know, love this and revolution that... But here, with lyrics about bank balance and salaries, it's good to have a translation at hand. 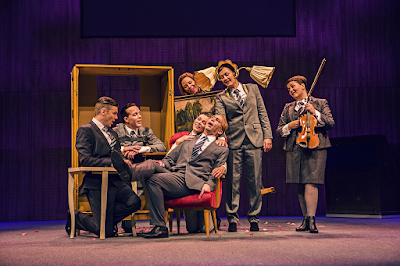 The musical has a cast of eight: Johan Aspelin, Anna-Maria Hallgarn, Erik-André Hvidsten, Saara Lehtonen, Thomas Lundin, Richard Mitts, Tove Qvickström and Maria Udd. Hvidsten portrays the titular character from cradle to grave. The others act like a Greek choir of sorts. They're relatives, employees, pieces of furniture (! ), praising Ingvar one minute and bashing him the next. The cast doubles as the orchestra. They're a multitalented group, playing everything from violin and guitar to accordion and reed organ. The cast sounds fantastic together, both the vocals and the instrumentals. This musical is a joy to listen to. It also looks like they're having fun onstage – so it's easy to have fun in the audience, too. If anything, I'm sorry I didn't see the first Finnish production of Ingvar! in Helsinki. But better late than never. Watching this musical was way more fun than any shopping trip to IKEA ever could be. I really wonder how Kamprad feels about this or if he sanctioned it!